Malaysia's prime minister is being widely lampooned on social media for a comment he made about the price of kangkung, or water spinach. Food is a faux pas minefield for politicians, especially when it's perceived as being used in a get-down-with-the-people kind of way - think of British Prime Minister David Cameron's pasty moment or Chancellor George Osborne's "posh burger" tweet. The almost inevitable response seems to be ridicule. That's where the Malaysian Prime Minister Najib Razak finds himself right now. With the government under fire because of price hikes in basics like fuel and electricity, he chose to push back by highlighting a reduction in the cost of the leafy green vegetable kangkung. Kangkung - also known as water spinach, morning glory and Chinese spinach - is widely eaten in Malaysia, and is cooked as a stir-fry with a little garlic or chilli paste. But it's cheap, grows wild alongside streams, paddy fields and drains, and is not considered a staple. Moments after a video of the prime minister was posted making the comments, the sarcasm and jokes began to trend on social media in Malaysia. 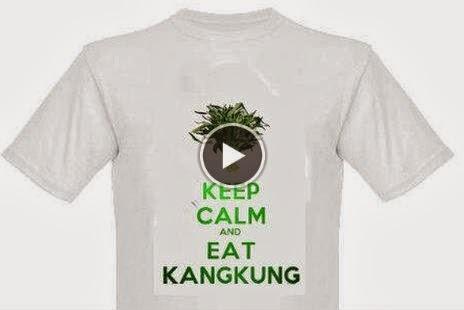 There have been hundreds of thousands of tweets, a Facebook page set up - with 10,000 followers already - a YouTube re-mix of his comments, the lyrics to popular and traditional folk songs have been re-worked, and "Keep calm and eat kangkung" T-shirts have been made and rushed to market. "Kangkung-gate", as it's been dubbed by some, has hit a nerve because many people are struggling with the rising cost of living, and are resentful of what they regard as corruption, and lavish spending by the government. Unsurprisingly many opposition politicians - including Anwar Ibrahim - have seized on the opportunity to join in the collective fun-poking. The story has been so big on social media that many have complained of their timelines being clogged up. "This kangkung obsession is fast becoming a laughing stalk," tweeted comedian Kuah Jenhan. "Lettuce get to the root of the problem. We have mushroom for improvement."